What is the Alert Mechanism Report (AMR)? The Alert Mechanism Report (AMR) initiates the fourth annual round of the Macroeconomic Imbalance Procedure (MIP). The procedure aims to identify imbalances that hinder the smooth functioning of the Member States' economies, of the euro area, or of the EU as a whole - and to spur the right policy responses. The AMR identifies Member States that may be affected by imbalances in need of policy action and for which further in-depth reviews should be undertaken. The AMR is thus a screening device for economic imbalances, published at the start of each annual cycle of economic policy coordination. It is based on a scoreboard of indicators with indicative thresholds, plus a set of auxiliary indicators. The AMR is not a mechanical exercise. It is not because a Member State reports an indicator beyond the indicative thresholds that an in-depth review is launched, as the Commission takes the complete economic picture into account. It is only on the basis of the in-depth reviews that the Commission will conclude whether imbalances, and potentially excessive imbalances, exist and put forward the appropriate policy recommendations. The in-depth reviews will be published in spring 2015 and will feed into the analysis underpinning the country-specific recommendations under the 'European Semester' of economic policy coordination. What is the relationship between the AMR and the Annual Growth Survey? The implementation of the MIP is embedded in the 'European Semester' so as to ensure consistency with the analyses and recommendations made under other economic surveillance tools. The Annual Growth Survey (AGS), which is adopted at the same time as this report, is the starting point of the European Semester. It takes stock of the economic and social situation in the EU and sets out broad policy priorities for the EU as a whole for the coming years. Moreover, the AGS links the correction of macroeconomic imbalances under the MIP to the need to swiftly address the challenges of promoting growth and investment, fighting unemployment, ensuring sustainable fiscal policies and restoring lending to the real economy. What are the main findings of this AMR on overall developments in the EU? Macroeconomic imbalances remain a serious concern and underline the need for decisive, comprehensive and coordinated policy action. EU economies continue to make progress in correcting their external and internal imbalances. High and unsustainable current account deficits have been considerably reduced, eliminated, or turned into surpluses and the process of balance sheet repair is progressing in all sectors in most countries. Furthermore, the recovery in competitiveness is encouraging, as a result of adjustments and reforms, but sustaining competitiveness remains a key concern in particular for Member States with large external imbalances. The high levels of private and public debt in most countries, and the high external liabilities in many countries still constitute substantial vulnerabilities for growth, jobs and financial stability. Unemployment and other social indicators remain very worrying in several countries, and economic growth has been insufficient to lead to a marked improvement in labour and social data. In general, slow growth and low inflation weigh on the reduction of imbalances and of macroeconomic risks. Data released during the summer and the autumn economic forecast show that economic activity has lost momentum and disinflationary tendencies have strengthened in most of the EU. In 2014 and 2015, economic activity in the EU is expected to grow at 1.3% and 1.5%, after having posted zero growth in 2013. The weakness of economic activity in the EU as a whole is also related to the very asymmetric nature of the rebalancing thus far, with weak domestic demand in creditor countries sustaining persistently large current account surpluses. Very low inflation adds to the risks related to excessive indebtedness and increases the economic costs of rebalancing and bringing down debt to more sustainable levels. The findings in the AMR also underline that the promotion of efficient investment to restore potential growth is a key priority. Over the last seven to eight years, since the start of the crisis, the EU’s growth potential has substantially dropped. According to the latest estimates, the annual growth in potential output of the EU fell from slightly above 2% ten years ago to below 1% currently. To what extent is the adjustment of current accounts progressing? Current account rebalancing remains asymmetrical reflecting weak demand in both debtor and creditor countries. The necessary correction in current accounts has continued in a number of countries, notably Ireland, Cyprus, Greece, Spain, Portugal, Romania and Slovenia. However, in many cases, much of the adjustment has been driven by a contraction in demand, particularly investment, which could have negative implications for medium-term potential if not corrected. On the side of creditor Member States, surpluses in some Member States have not sufficiently declined in reaction to the large rebalancing efforts of the economies that used to register large current account deficits. Germany and the Netherlands have continued to post very high surpluses, above what economic fundamentals would imply, and well above the indicative threshold of the MIP scoreboard. However, the geographic composition of the surpluses in creditor economies, particularly Germany, has changed. The surplus vis-à-vis the rest of the world has increased, while the surplus vis-à-vis the euro area has declined. The latter has been driven mainly by a reduction in exports to the rest of the euro area, rather than an increase in imports by Germany. Although current account surpluses do not pose the same challenges as unsustainable deficits and are partially justified, large and protracted surpluses may reflect economic inefficiencies with low domestic investment and demand, which in the medium run leads to wasted potential output domestically and negative spillovers to euro area partners. Going forward, the euro area as a whole is expected to maintain a relatively large current account surplus. The euro area current account surplus has increased by 3 percentage points between 2008 and 2014 to reach 2.5% of GDP according to the Commission autumn economic forecast. The current account surplus of the EU as a whole is expected to reach 1.4% in 2014. Promotion of efficient investment to support potential growth is therefore a key priority, especially in creditor countries. Which EU Member States warrant an in-depth review according to the current AMR? 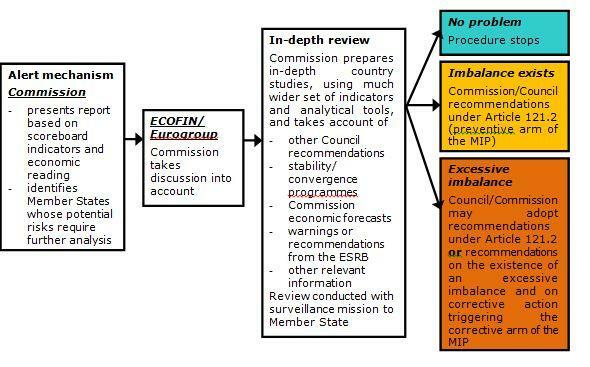 Based on the economic reading of the MIP scoreboard, the Commission finds that in-depth reviews (IDRs) are warranted to examine in further detail the accumulation and unwinding of imbalances and their related risks in 16 Member States. For several countries, the IDRs will elaborate on the findings of the previous surveillance cycle, while for others, it will be the first time the Commission will prepare an IDR. This is, in particular, the case for the Member States that have recently completed, or are on the point of completing, their economic adjustment programmes supported by financial assistance. For Ireland, Spain, France, and Hungary - Member States with imbalances in need of decisive policy action - IDRs will assess risks related to the persistence of imbalances. For the other Member States previously identified as experiencing imbalances (Belgium, Bulgaria, Germany, the Netherlands, Finland, Sweden and the United Kingdom), IDRs will assess in which Member States imbalances persist, and in which they have been overcome. For the first time, IDRs will also be prepared for Portugal and Romania. After the completion of its economic adjustment programme in mid-2014, Portugal joins the standard surveillance procedures. For Romania, the surveillance of imbalances and monitoring of policies has taken place under the adjustment programme, which is supported by precautionary financial assistance. While this arrangement is still ongoing, the delays in completing the semi-annual reviews imply that Romania should be re-integrated in the MIP surveillance. For the Member States that benefit from financial assistance, the surveillance of their imbalances and monitoring of corrective measures take place in the context of their programmes. This concerns Greece and Cyprus. However, the situation of Greece, in the context of the MIP, will be assessed at the end of the on-going financial assistance, which is expected by end-2014, depending on the arrangements to be eventually agreed. For the other Member States, the Commission will not at this stage carry out further analyses in the context of the MIP. On the basis of the economic reading of the scoreboard, the Commission is of the view that the macroeconomic challenges of the Czech Republic, Denmark, Estonia, Latvia, Lithuania, Luxembourg, Malta, Austria, Poland and Slovakia do not represent imbalances in the sense of the MIP. However, careful surveillance and policy coordination are necessary on a continuous basis for all Member States to identify emerging risks and put forward the policies that contribute to growth and jobs. On which economic indicators is the scoreboard used in the AMR based? The scoreboard used in the AMR is currently made up of eleven indicators with a view to monitor external imbalances and competitiveness as well as internal imbalances. The indicators in the scoreboard allow an early identification of imbalances that emerge over the short term as well as of imbalances that arise due to structural and long-term trends. Indicative thresholds have been set for each indicator. The AMR includes also a set of auxiliary indicators which are useful for the interpretation of the scoreboard of indicators. Since last year, the auxiliary indicators have also covered a number of relevant social indicators; their analysis should help better understanding the social costs of imbalances in their different guises and of the required adjustment. These social indicators refer for example to the rate of people at risk of poverty, social exclusion or the share of persons (as percentage of the total population) who are living in households with very low work intensity. However, there are no thresholds for these auxiliary indicators. 3 years percentage change in nominal unit labour cost(ULC), with an indicative thresholds of +9% for euro area countries and +12% for non-euro area countries. -/+5% for euro area countries and -/+11% for non-euro area countries; the REER shows price competitiveness relative to the main trading partners. year-on-year percentage change in total financial liabilities of the financial sector, with an indicative threshold of 16.5%. Regulation No 1176/2011 on the prevention and correction of macroeconomic imbalances defines a macroeconomic imbalance as 'any trend giving rise to macroeconomic developments which are adversely affecting, or have the potential to adversely affect, the proper functioning of the economy of a Member State or of the Economic and Monetary Union, or of the Union as a whole', while excessive imbalances are 'severe imbalances that jeopardise or risk jeopardising the proper functioning of the Economic and Monetary Union'. In general, any deviation from a desirable level can be considered as an imbalance. However, not all imbalances are detrimental or require policy interventions as they may be part of the economy's dynamic adjustment. Imbalances that require close monitoring and possibly policy interventions relate to developments that could significantly impede the proper functioning of the economy of a Member State, the euro area or the EU. In practice, these are imbalances that are either at dangerous levels (e.g. high debts) or reflect unsustainable dynamics (e.g.excessive house price or credit increases) that threaten to result in abrupt and large, and hence damaging, adjustment. For example, having a large and persistent current account deficit is considered an imbalance if it runs the risk of leading to a 'sudden stop' and ensuing large welfare costs. What are the next steps following the AMR adoption? The conclusions of the AMR will be discussed in the Eurogroup – if they concern euro area Member States – and in the Economic and Financial Affairs Council (ECOFIN). The Commission is also looking forward to the contribution of the European Parliament and key stakeholders. Moreover, the European Council will hold a discussion in December following the publication of the Annual Growth Survey and the AMR with the aim of agreeing on the main areas for coordination of economic policies and reforms. Taking all the reactions into account, the Commission will prepare country-specific in-depth reviews in the coming months and present them in spring. This will involve a dialogue with the Member States concerned. To prepare the IDRs, the Commission will base its analysis on a much richer set of data then the one used in the AMR: all pertinent statistics, all relevant data, all material facts will be taken into account. It will be on the basis of the IDRs that the Commission will conclude whether imbalances or excessive imbalances exist, and subsequently prepare the appropriate policy recommendations for each Member State. The Commission has recently published reports for Italy and Croatia on the implementation of MIP related reforms. How do they fit into the procedure? To enhance the monitoring on the follow up of reforms under the MIP, the Commission carries out ‘specific monitoring’ on policy implementation in the countries identified with excessive imbalances. In the previous round of the MIP this applied to Italy, Slovenia and Croatia. As part of the ‘specific monitoring,’ special missions and two reports are foreseen per cycle. The first reports on Italy and Croatia were published on 7 November. They review the progress in adopting and implementing policy measures which could contribute to the unwinding of the macroeconomic imbalances, in line with the latest set of country-specific recommendations (CSRs) endorsed by the Council in July 2014. The report on Slovenia will follow. The Commission will produce second specific monitoring reports for Italy, Croatia and Slovenia in early 2015. In addition to countries with excessive imbalances, euro area countries ‘with imbalances requiring decisive action’ are also subject to specific monitoring. This currently affects France, Spain and Ireland. For Spain and Ireland, the monitoring is integrated into their post-programme surveillance. Generally, the reports are part of the follow up of the MIP cycle that started in November 2013. It should also be noted that the ‘specific monitoring’ is of informal nature and does not correspond to a legal step in the MIP. What is the possible outcome of an in-depth review? An in-depth review does not automatically lead to a recommendation or the identification of imbalances. The Commission's analysis could result in one of three different scenarios shown by the graph below. 1. If the situation is considered unproblematic, the Commission will conclude that no further steps are necessary under the MIP. 2. If the Commission considers that a macroeconomic imbalance exists or could arise, it will come forward with the appropriate recommendations under the preventive arm of the MIP. The Member State concerned will be asked to correct the imbalance or prevent an imbalance from occurring. These recommendations are presented in the context of the European Semester as part of the package of country-specific recommendations (May/June). 3. If the macroeconomic imbalances are considered excessive and may jeopardise the proper functioning of the Economic and Monetary Union, the Commission can recommend that the ECOFIN Council identifies an excessive imbalance and places the Member State under an Excessive Imbalance Procedure; this is the corrective arm of the MIP. So far no Excessive Imbalance Procedure has been launched. However – in addition to receiving policy recommendations in the context of the European Semester – countries with "excessive imbalances" are under "specific monitoring". This ensures a regular review of policy measures aimed at addressing the imbalances. Are any sanctions planned to ensure that the MIP is properly carried out? No fines can be imposed under the preventive arm of the MIP. As regards the corrective arm, i.e. if an Excessive Imbalance Procedure is launched, the situation is different: In this case financial sanctions (up to 0.1% of GDP) can be imposed for euro area Member States if they repeatedly fail to deliver a sufficient corrective action plan or to take agreed action. It is important to note that it is the failure to take adequate measures that could be sanctioned, not the fact that the imbalance has not disappeared. In March 2014, the Commission identified imbalances in Belgium, Bulgaria, Germany, Ireland, Spain, France, Italy, Hungary, the Netherlands, Slovenia, Finland, Sweden and the United Kingdom, among which Croatia, Italy and Slovenia were experiencing excessive imbalances following the In-depth Reviews. The Commission takes the view that, since imbalances are identified after the detailed analyses in the previous IDRs, the conclusion that an imbalance has been overcome should also take place after duly considering all relevant factors in another in-depth review.